A Story of Their Own: What Happened and What is Going on with North Korean Archaeology? A handful of information regarding North Korean archaeology is currently available in the form of papers published in South Korea. However, these accounts are still enigmatic because of the lack of reliable sources to provide data or corroborate views and interpretations. North Korean archaeology emerged as a pure scientific interest in the remains of past societies; it developed as an intellectual protest against colonialism; it served as a pragmatic tool for self-realization of two prominent archaeologists, former friends turned rivals; and finally, it materialized as a masterminding plan of a national leader. 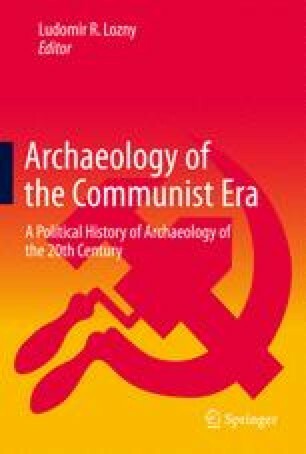 Two major shifts are identifiable in the history of North Korean archaeology: first, its initial development into a scientific discipline by a combination of historical materialism and culture-historical approach borrowed from the West, and second, because complicated international circumstances and internal political conflicts did not allow archaeology to develop as it was originally intended, Jucheism emerged as a cross-national overriding rule and directly influenced the objective and direction of North Korean archaeology. Thus, its history offers useful hints regarding misuse of archaeology for the maintenance of power and pursuit of nationalistic goals through manipulation of data and mixing the mythical stories with archaeological facts. This chapter was written with support from many colleagues and I feel much obliged to all of them. I would like to specially mention: Ms. Kim Jiin of ZinInZin Press, Prof. Yi Kisung of Korea National University of Cultural Heritage, Prof. Han Changgyun of Yonsei University, Prof. Yi Seonbok of Seoul National University, and Prof. Seo Il-beom of the University of Yanbian, China. I admit that the responsibility for any mistakes and errors are solely mine.